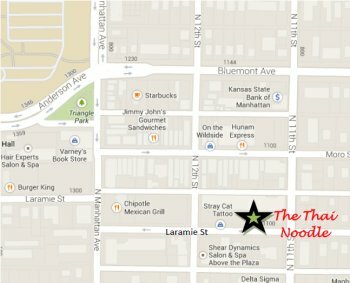 The Thai Noodle in Manhattan now delivers!! Call (785) 473-7201 or go to Wildcat2go.com to see our full menu and place your order! Enjoy!!! We open on Saturday, March 1, 2014, at 5 pm if a special sneak preview of the best Thai noodles in Kansas! Come join us for this "soft launch" as we prepare for our grand opening next week. Baan Thai Restaurant presents a unique dining experience in Manhattan, Kansas! From the restaurant that brought authentic Thai cuisine to the people of Manhattan and the greater Flint Hills region, The Thai Noodle brings you the noodles of Asia--with the authenticity you have come to expect from Baan Thai--at an affordable price. Dine-in or carry-out, we promise the best Thai food this side of Bangkok! From noodle soups to stir fried noodle dishes to a selection of rice favorites from Baan Thai, we offer a wide range of choices for any taste. In addition to authentic Thai noodle dishes, we also offer some of the favorite noodle dishes of Asia, including Vietnamese phó and Korean kim-chi lo mein. We also offer authentic Thai beverages, like Thai ice tea, and Asian favorites like bubble tea and bubble smoothies. Copyright © 2019 ProSIM Company, Inc.